January was taken up with staying out of the cold, occasionally venturing into the garden to work on the apéro terrasse. We had just returned from Australia, so the change in weather (even though we knew what to expect) was a bit of a shock. 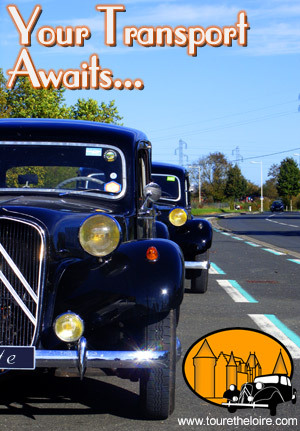 We also went to Paris to Retromobile, which was fun and will be an annual event in our calendar. In February, winter went, then came back again - twice. 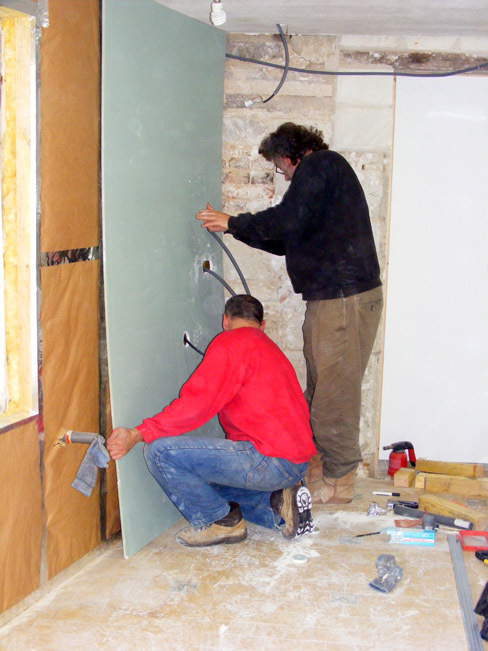 We started thinking seriously about bathrooms: where they would go and how they would be equipped, even to the extent of starting to shop for fittings and furniture. The big news, of course, was Xynthia. We survived her without too much trauma (and no damage). March's exciting event was the arrival of the cranes. It was the first time we had ever seen them, and like everyone else we took them to be a sign of spring arriving. A week later, winter arrived again with some more snow. We started buying the materiel for framing and insulation for the bedroom and bathroom walls, an ongoing event throught the year. April. 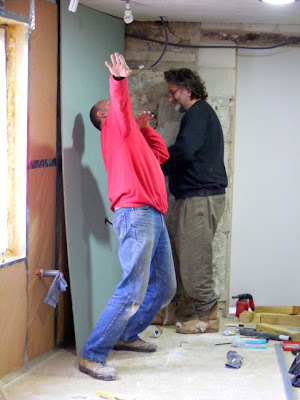 This was the month we started working with our business. 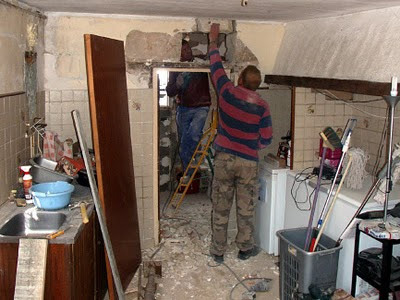 At home, we commenced the rennovations with a vengence, starting with the guest bedroom and bathroom. At the same time, the stonemasons were here, replacing the stonework around the back door, and raising the lintel of the laundry door so I could walk (rather than crawl) in there. We also met Jim Budd, and dined at le Detour for the first time. Phew! 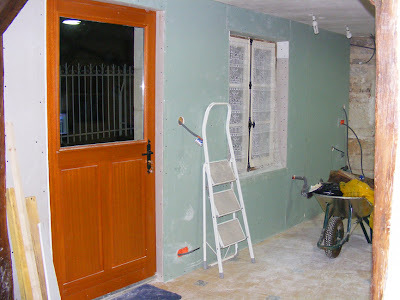 In May we celebrated 12 months living in France, work continued on the house, we had frost after the Saints des Glace, and plenty of orchids in the orchard. We spent quite a lot of time in Célestine, both with paying guests, and just for the sheer joy of it. The dust, the dirt, the stuff all over the place! June was exciting. Just one word: bathroom. With working shower and hot water and everything (I know - I have exceeded the self imposed limit of one word, but it was that exciting). Later in the month the roofers arrived to re-roof the bits that weren't done in 2007. All that in six months? No wonder I am tired! Extra special happy birthday wishes to my mother, who is 80 today. She and my father are being treated to a few days at O'Reilly's Rainforest Guesthouse with my sister and brother-in-law. Sorry I can't be there. A picture of them all from Christmas 2009 is here. Susan. At last the exterior wall of the kitchen is fully insulated and lined. It looks great, but it seems to have taken its toll on the workforce. 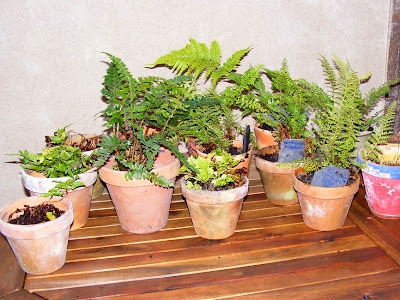 A few months ago I put the word out amongst my gardening friends that I wanted to create a fernery at the back of the house, around the coin d'apéro. I asked if they had any little ferns that were surplus to requirements that I could use to augment the half dozen ferns I currently had dotted about the front courtyard. Thanks to Jill, Louisa and an unknown client of our professional gardener friend Nicole (whose husband Alex made the terrace) I received a lovely selection of hardy native ferns, and they've been settling in for a while now. To my surprise my friend Jean-Pierre, the retired director of the Parc Floral de Paris and an acknowledged fern fancier, said he didn't have any ferns in his garden. However, he had ordered one of each variety supplied by a nurseryman mate, and they were a gift! A bucket full of ferns from J-P.
A few days before Christmas he arrived in town to stay with his mother, bringing the ferns. I discovered he'd actually ordered two of each, and was planning a fernery of his own in the courtyard of his mother's house. We sat at her kitchen table and carefully labelled them all and split some that had arrived as single plants. Then I brought my share home and potted them up in the sleet. They are all perfectly hardy, so they should be fine. There are 13 of them, all different. 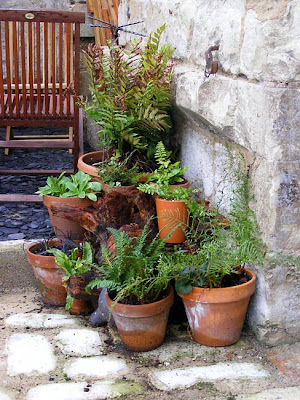 The new ferns, potted up. Part of the fernery, before the new additions. Much of the garden at the back of the house gets no sun, or very little. 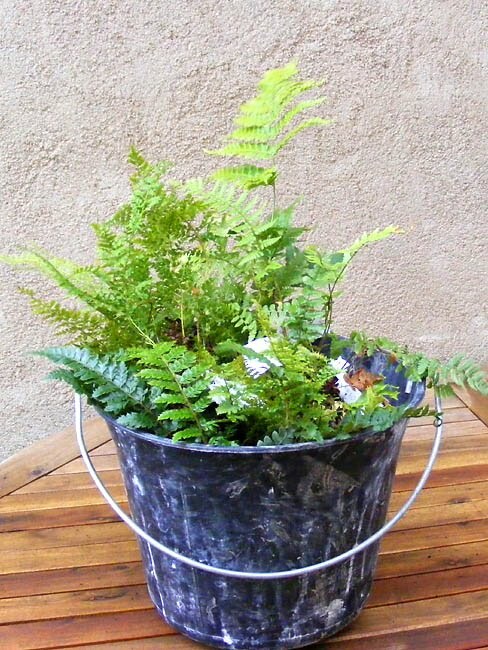 The ferns should thrive here, and watering them should not be a problem. 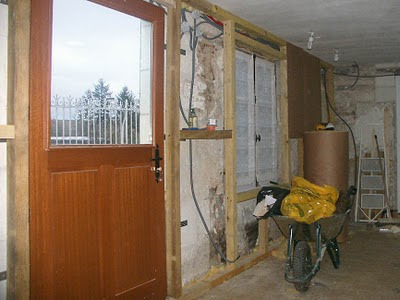 The next big challenge is planting out the section of the garden that does get sun, and where the soil is mostly clay. In the summer it is baking hot and dry, and in the winter, cold and wet. Nothing I've planted so far has been a great success. Ideas please?! 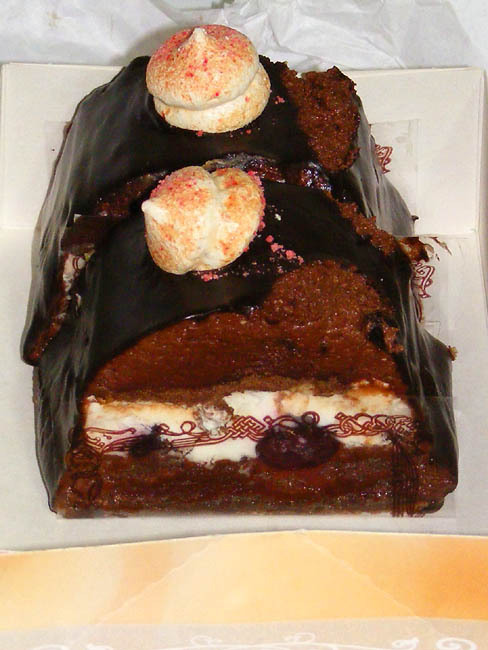 It is traditional in France to have a bûche for Christmas — a yule log in gloriously squidgy cake form. They are rather expensive and I didn't think we needed a whole one, so instead I bought a buchette each. These were two hefty slices from a Black Forest bûche, but buchettes also come in complete mini bûche form, decorated with silver miniature axes. For this sort of fancy cake I always go to the boulangerie pâtisserie 'down the hill'. Aurelien, the young pâtissière, is a formidable pastry cook and Sophie, his wife, is a real sweetie. When I went in for the buchettes, and some meringues for our Christmas pavlova I was able to congratulate them on their latest achievement - a baby girl, born on 1 December and named Tia. 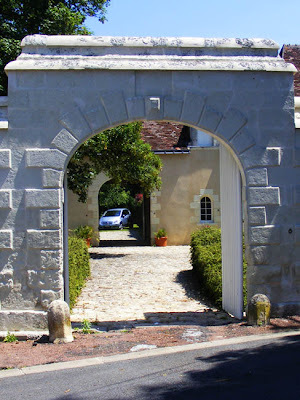 The rather rambling 17th century house you get a glimpse of through the imposing gateway in rue du Cygne, Preuilly-sur-Claise, is known as Hôtel d'Harambure, after the man who constructed it. The word hôtel in this case denotes a private town house, not an establishment with rooms available to rent for the night, although both meanings are used in French. 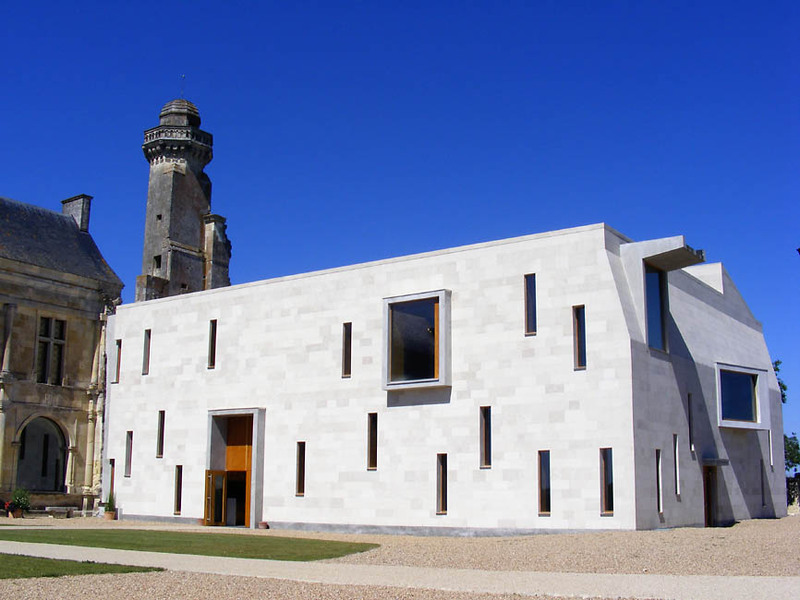 Curiously, this is the only building in Preuilly listed in Le Patrimoine des communes d'Indre-et-Loire as being made of pierre (stone). This is as opposed to tuffeau, the soft local limestone. I assume the implication is that it is made of rough field stone, or more likely, harder stone that has been imported from another district. One of the most interesting features of the interior is a remarkable box bed, contemporary with the construction of the house and installed for the cook. The cook was an important character in this type of household, so their safety and comfort was taken into consideration. The highset bed made getting in and out easier and protected its occupant from rats. Jean d'Harambure was a loyal companion of Henri de Navarre at the time of his struggle to win the throne of France and become le bon roi Henri IV. During the battle of Aumale against the Spanish in 1592 he saved the king's life, losing an eye in the process. 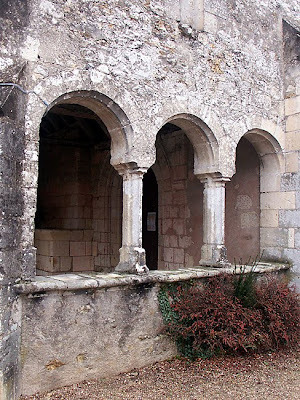 Like the king, he came from Navarre, a small kingdom in the French Pyrenees, in the south-west of modern France. Settling in Preuilly, Harambure built this house and founded a family. 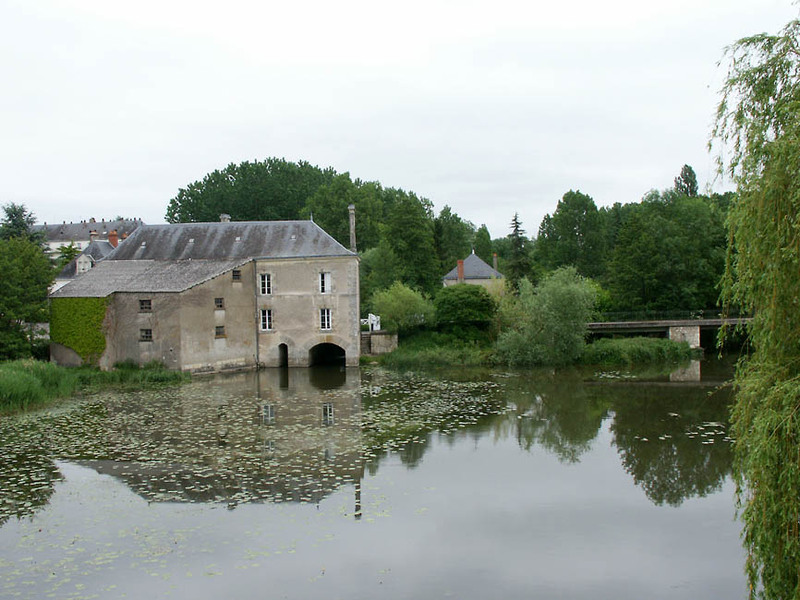 The family prospered and grew, so Jean built another manor house and barn, this time at nearby Yzeures-sur-Creuse. Protestant, he recanted his faith under Louis XIV, who revoked his grandfather Henri IV's pragmatic solution to the Wars of Religion, the Edict of Nantes. Once again, it was awkward, if not dangerous, to be a dissenter. Royalists like the Harambure family were given the choice of emigrating or abjuring. By the 18th century the family had expanded its holdings to include a manor and a fortified farm near Chaumussay. Jean's descendant François d'Harambure was the representative for Preuilly in the Estates-General of 1789 held at Versailles. This national general assembly, a sort of parliament, was called by Louis XVI in the expectation of sorting out his government's financial difficulties. Instead, it triggered the Revolution. Although firmly monarchist, François d'Harambure was an equally firm constitutionalist, and served as a general during the Revolution. He seems to have been a level headed and courageous man who strongly and publically stood up for what he considered right, no matter which side of the political fence it fell. However, after narrowly avoiding execution in 1793, he retired from public life at the age of 51 to spend the remainder of his days quietly in Preuilly. Here is a selection of the food we enjoyed over Christmas. I bought the leg of lamb in September when it was on an excellent special (7.40€/kg). It's been sitting in the freezer awaiting the proper moment for us to cook it. Christmas seemed as good a moment as any, and 17.40€ for the Christmas joint seems like a real bargain. There will be lots of left overs, so shepherds pie is on the menu soon too. Yum. With no indication of where the lamb grew up, I am guessing it came from New Zealand. If it was French it would say so loudly and proudly (and be twice the price). The oysters I bought on the Thursday before Christmas. They are size 3 fines, finished in the saltmarshes of Marennes Oléron and have the IGP to prove it. The oyster beds at Marennes Oléron are in the area our oysters usually come from, being only 2-3 hours west of us on the coast. The selection of oysters only included fines and speciales, the top two categories. These ones, produced for the supermarket (ie. 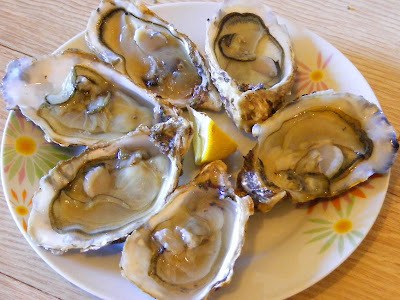 'own brand' oysters) were the best value, at 18.95€ for 2.8kg (3 dozen). I could have paid over 40€. Normally we pay about 13 - 15€ a box, but we generally buy the ordinary creuses, that are not finished in the saltmarshes for extra flavour, plumpness and the dark green algal fringe that is particularly highly prized. This year there has been a lot of publicity about a price hike for oysters, but from what I've read, the real problem will be next year, as many of the baby oysters have died due to a bacterial attack. The clementines are a treat for Simon. Curiously, I love the smell, but dislike the taste. They were 2.50€ for a box and have just hopped across the border from sunny Spain. Clementines are big business at Christmas time in Europe, but I don't remember them being so in Australia (maybe because the boxes of mangoes were more enticing to me). Apparently the trendy Christmas dinner this year in France was snails and venison, but many families opted for the traditional oysters, foie gras and turkey. French families would eat Christmas dinner on Christmas Eve, rather than the day itself. 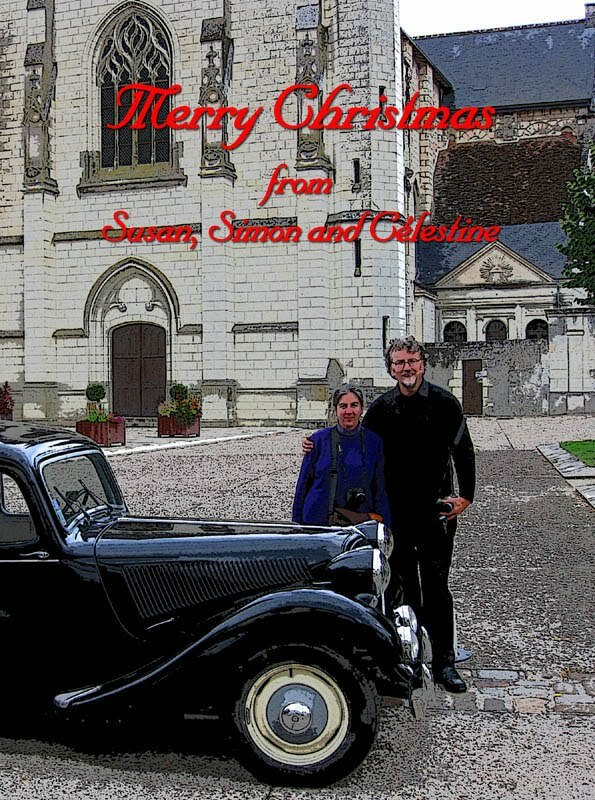 ... and thank you to everybody for you kind comments, friendship, and help over the year. This year we are not having a bird for Christmas, but a roast leg of lamb. Not traditional, but a firm favorite. 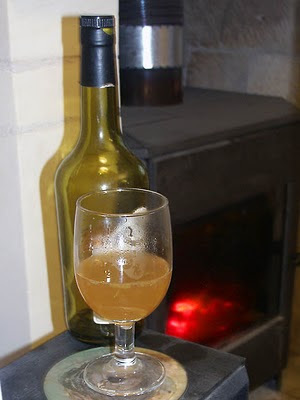 We will probably be having pavlova for dessert, and the drink for this season is a sparkling nectar du rhubarb. Winter - whole days spent in front of a blazing fire, catching up on the year's listening (today's special "The Smoker You Drink, the Player You Get" from 1973, because you can't rush these things). Which is apt. Stick it all in a saucepan and put in on the top of the fire. After a couple of hours, you can pour into mugs, and lace with calvados. The days are getting longer - I have no doubt I am not the only person who finds irony in the fact that the (official) first day of winter is also the day on which spring sort of starts. 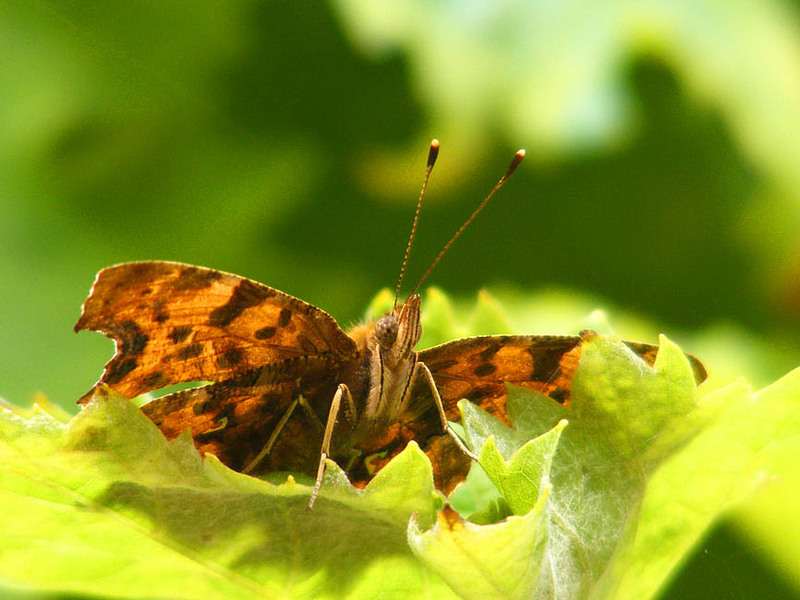 So in celebration of all things summery and sunny, some photos from earlier this year. 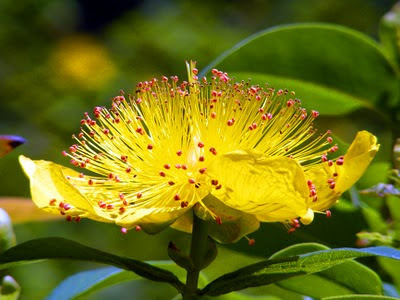 A lovely big St John's Wort flower. Sitting here in a very grey and dull Preuilly sur Claise it's difficult to believe such colours exist, let alone the fact that they were here only 4 or 5 months ago. 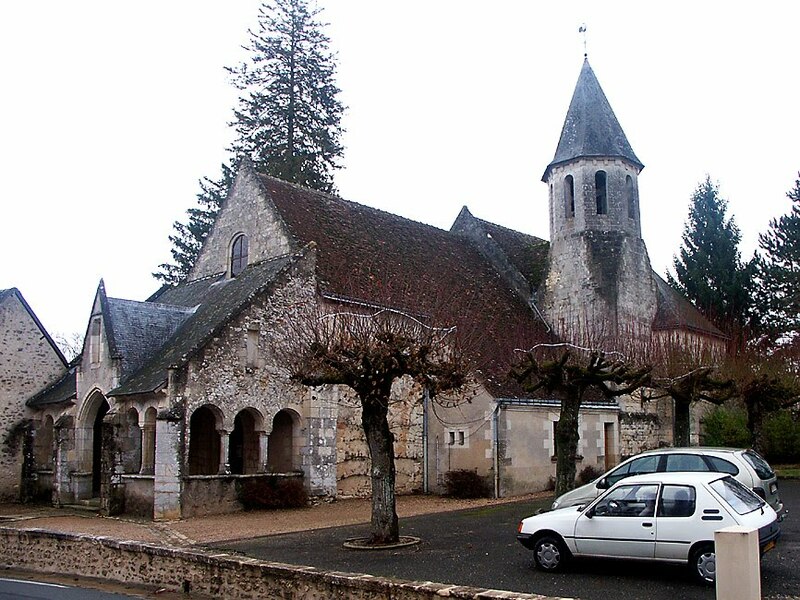 Saint Jean - Saint Germain is a combined village (one saint per village, as it were) just south of Loches. 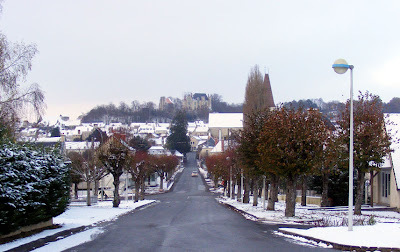 Google maps often gives a route through the village to places north of Loches, but the roads are narrow and indirect, so we have never been there before. I have marked it here. We drove through the village yesterday on our way to the sous-prefecture to sort out some health system paperwork. The day was grey and dull, so we thought we would do some exploring, just in case the route is a good one. It turns out to be an interesting drive, but a lot slower than the more logical route via Loches. 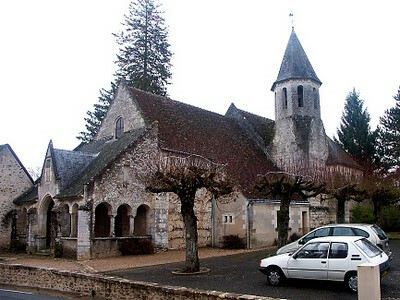 The building that really caught our eye was the church, much of which dates from the 11th century . It's one of those churches with a really interesting porch, which dates from the 15th century. The tower too is noteworthy, being square at the base and octagonal at the top. The church was locked so we didn't get to see inside, but hopefully one day we will be passing again and see what the inside of the pretty building is like. 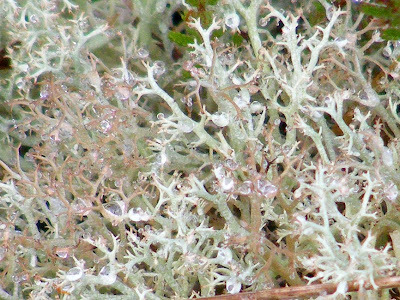 I think this is a species of Cladonia, a type of lichen known in English as Reindeer Moss and lichens des rennes in French. 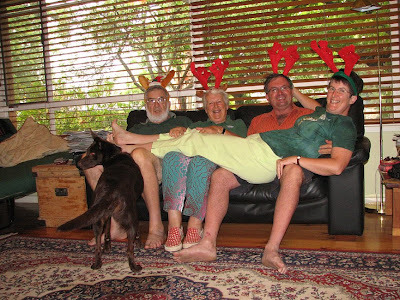 Luckily, the Mobile International Bryophyte-Lichen Team (MIBLT) are due here any day now - only five more sleeps to go, in fact. All I have to do is leave a good sized sample of the lichen, some alcohol and a note asking them to identify it on my mantlepiece on the evening of 24 December, and when they visit during the night they will provide the answer for me to find in the morning. I assume the alcohol is necessary for some of the diagnostic chemical reaction tests. Growing on the old railway track between Preuilly and Chaumussay. I am surprised at how few people know of this excellent auxilliary service that the Klaus Corporation provides. It's an efficient and creative example of the sort of multi-tasking undertaken by streamlined and switched on modern organisations, although I note that even the most well-known female members of the team have had operate in the workplace like males. On the roadside in the forest near Preuilly. 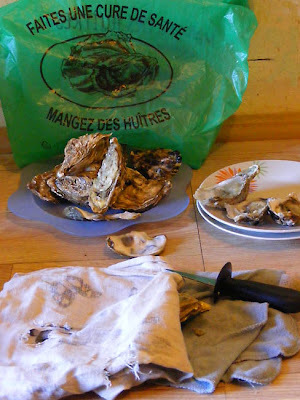 In France the winter holidays mean oysters and les huîtres mean les fêtes de fin d'année. 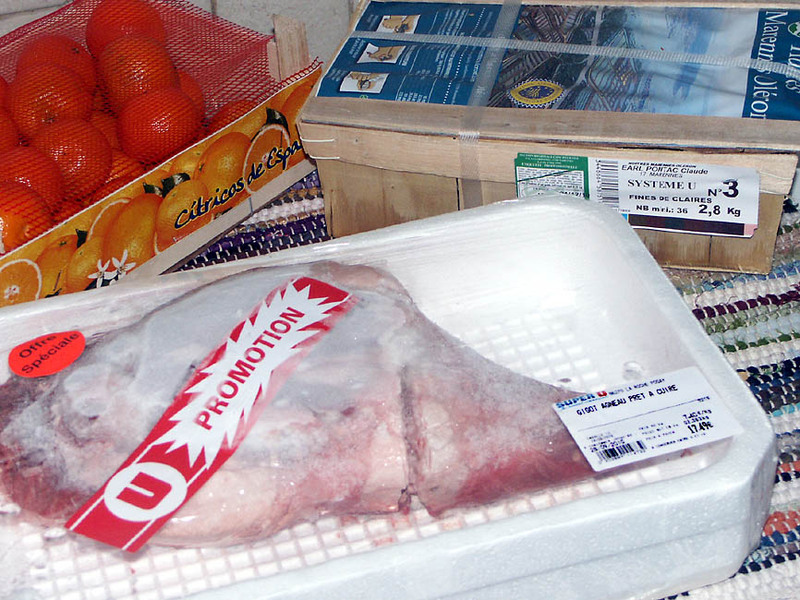 They are inexpensive and widely available, at supermarkets, markets and fishmongers. Simon and I usually buy a box of three dozen size number 3. We eat them day and night, breakfast, lunch and dinner, cooked and raw, for a couple of days until they are gone. Our temporary kitchen is so cold they are fine just left in the box on the bench. La Plate ('the flat'): for centuries this was the only oyster to be had on the coast of France, but a disease caused their disappearance in the 1970s. Quite rare today, you find them sold as belon in Brittany and gravette in the Arcachon Bassin and Bouzigues. 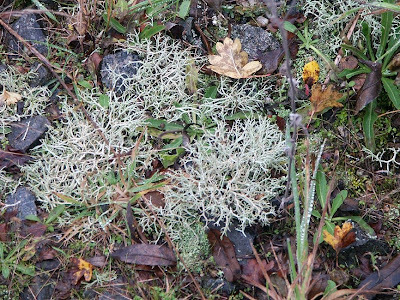 The wild variety is called pied-de-cheval ('horse hoof'). L'huître plate can be recognised by its round shell and grey-white flesh. It has a full-bodied flavour, very salty and should be prepared with the greatest simplicity. 'Take a health cure - eat oysters' is what is says on the bag. 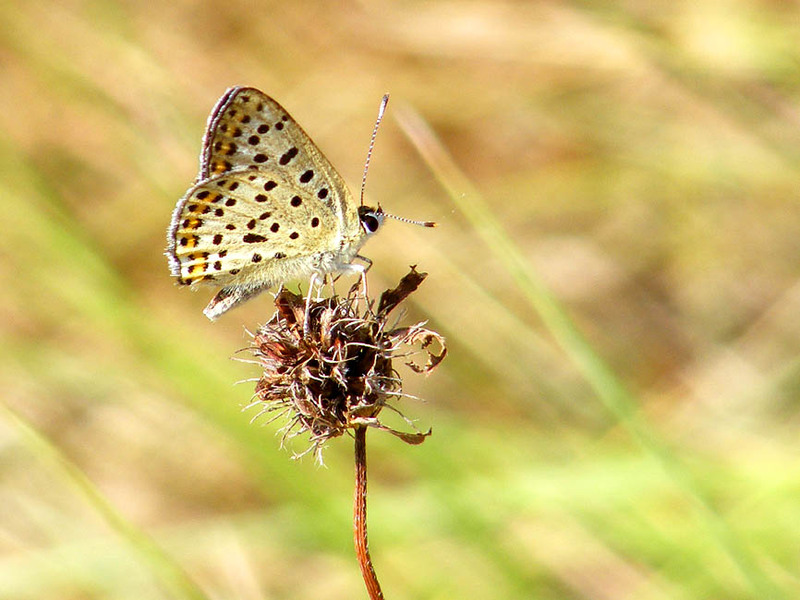 La Creuse ('the hollow'): This is by far the most common and the most affordable. They vary subtley in flavour depending on their geographical origin - salty and nutty from Normandy, iodiney and recalling the shallow estuaries in Brittany, delicate and invigorating from the Atlantic coast. Allow 6-8 oysters per person if you are eating them raw, and 5 if they are served warm. They are numbered from 0 (the biggest and fattest) to 6 (the smallest). On a platter, numbers 3-4 are ideal (below). La Pousse en Claire ('the saltmarsh grown'): A little gem from the Charentes, protected by a Label Rouge certification, this is the most desirable variety, unlike any other. Raised from 4 to 6 months in shallow water, only 2 to 5 oysters per square metre, they acquire an almost crunchy firmness. Generously filling out their semi round shell they have a mild sweet taste. If you find them, eat them as they are, as they need nothing to enhance them. La Fine ('the fine'): A speciality of Marennes and Oléron, these oysters are finished in the old salt marshes. The fines stay there a month, 20 oysters to a square metre. An even more deluxe version, the spéciales, are only 10 to the square metre and stay in the saltmarsh twice as long, developing more flesh with a very sweet flavour. 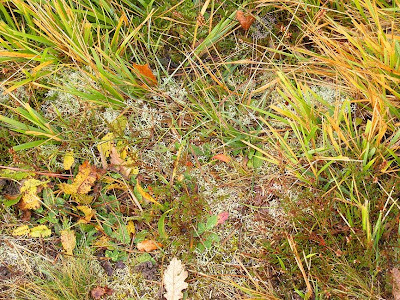 The vertes (green fringes) are very prized, retaining traces of a microscopic algae. They are eaten plain or with a drop of lemon juice, a trace of shallot vinegar and bread and butter. I have a sort of cold, it's too cold outside for Susan to go into the garden and do outdoor stuff, so the past couple of days we have just stayed inside in the warm. It hasn't snowed (despite dire warnings every evening about the following day) but today we have snow forecast again - yesterday was a lovely looking day and last night was perfectly clear, so who knows. 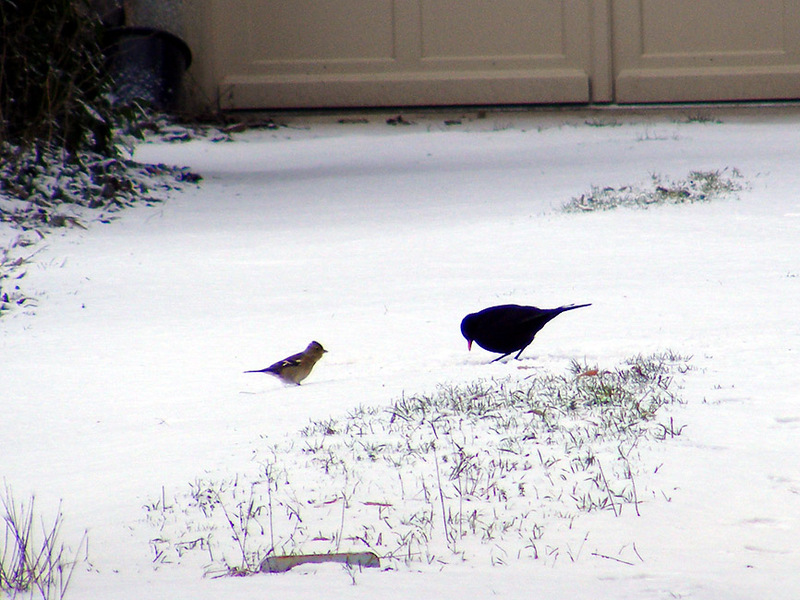 This morning on my walk to the boulangerie it was trying to snow, but not trying very hard. Last August, my brother paid us a visit. He had been living in London for the previous 18 months and was about to return home to Australia. He drove down with his wife, Rosie, and Jess and Jack. On the Saturday we went velorailing, which was ace fun (if a little hard work). Because there were six of us and the carts only take five people we split into two groups: Susan and I travelling with Jack, and the other three following on aboard the cart behind. 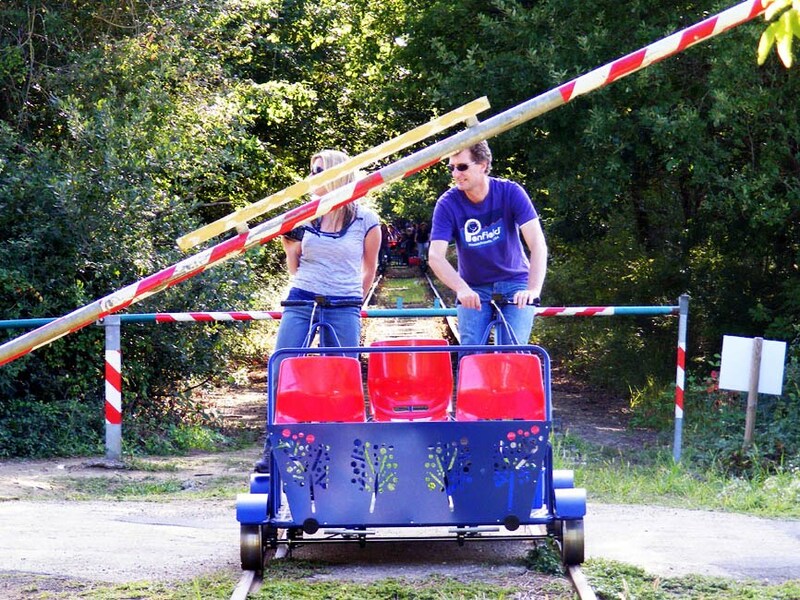 For those not in the know, velo-rail is a little rail cart fitted with pedals. 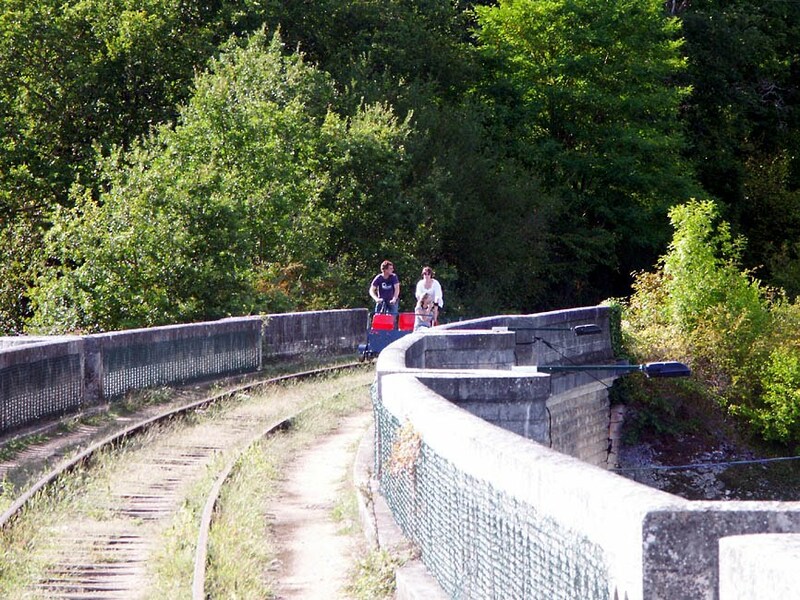 They are a feature on quite a few of the closed railway lines in France and are usually between 10 and 30 kilometres long. 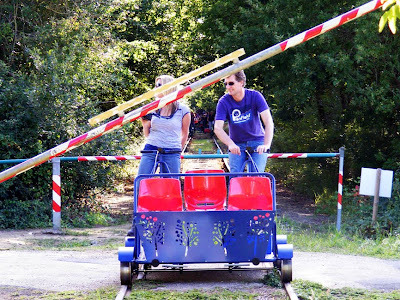 Two people pedal (assuming that there are two people pulling their weight) and they sound just like little trains, with a clickity clack and everything. So there you go: velorailing. Great if you have a couple of teenage kids to do the pedalling for you, hard work (but still great) if you have to pedal yourself. 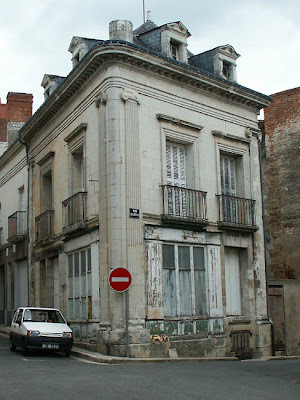 This 19th century tuffeau house on the corner of rue de l'Horloge and rue des Douves is in the so-called 'Preuilly style' created by the architect Créchet around 1850. The rather grandiose style here is demonstrated by the use of fluted pilasters topped by Greek capitals. Before the reworking of the facade by the architect, this property was the Hôtel de l'Image-de-Notre-Dame (or as it was known from 1793 – the Hôtel de l'Image). I assume the name change was a response to Revolutionary ideas on religion, and possibly because the original name was just a bit of a mouthful. 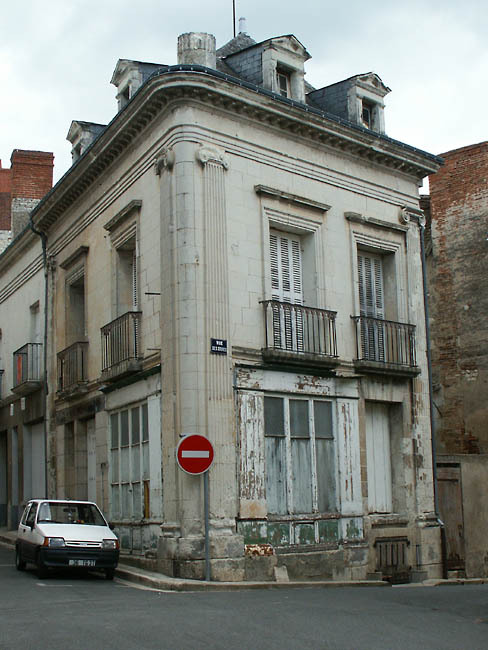 There is still a Hôtel de l'Image in Preuilly, but it is no longer in this building. 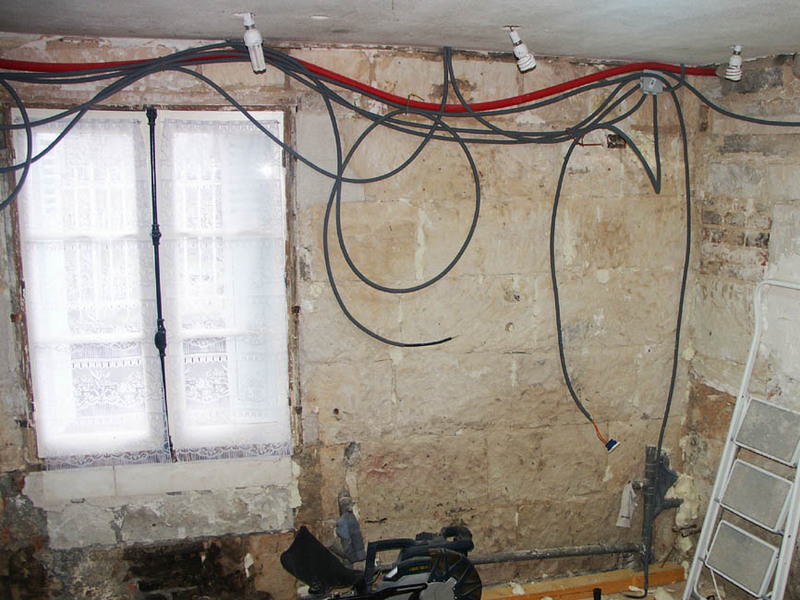 It is now run by our friends the Chedozeau family from a building on Place des Halles. In 1920 the house was Henry Baamonde's bicycle shop. He hung the newest bicycles up high so that they were all the more tempting for the small boys that loitered around the shop. According to Roger Lezeau, who was one of those small boys, Monsieur Baamonde reigned there amongst the tyres smelling of rubber which gave the place a very particular ambiance. The brands sold included Délecta, JB Louvet, Sutter and Alcyon. The bicycle repair workshop was in a building opposite and the family lived above the shop – Monsieur Baamonde, originally from Spain, his pretty brunette wife from Charnizay and two sets of twins, two boys, two girls. Unusually for the time, Madame Baamonde had also given birth to triplets, but sadly they did not survive. The slightly odd cylindrical chimney on the corner of the building was once higher, and must have had the top few courses removed in relatively recent times. Le Patrimoine des communes d'Indre-et-Loire shows it with its chimney intact in about 2001. 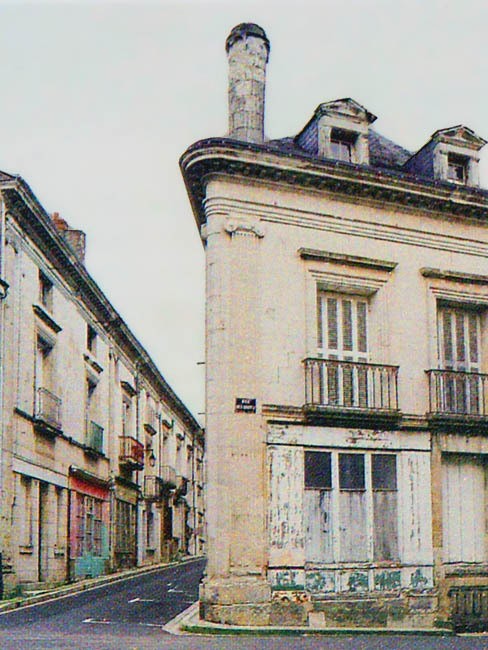 At some later stage in the 20th century the maison presumably became a plumber's business premises, because the wooden window surrounds say chauffage in peeling paint. The horloge (clock) that the street is named after was attached to the medieval gateway in the town wall, which ran close to the house and prevented anything bigger than a donkey using the street. It was demolished in the 1850s. Winter has really set in. Although yesterday was lovely and sunny (and clear), it was very cold, not getting much above freezing. 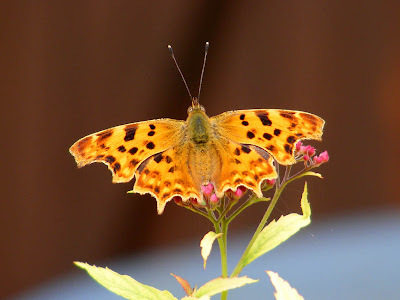 Rather than attempting to depress everybody with continual photos of winter and complaining abut the cold, we will occasionally be posting some photos from summer that somehow missed getting on to the blog. 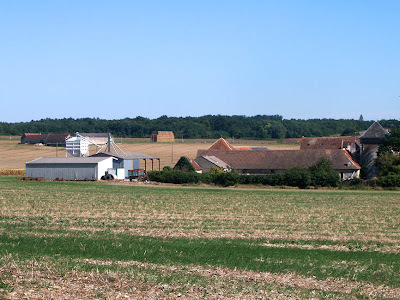 When I think of the late Touraine summers this is what I think of: stone farmhouses surrounded by fields of golden grain, clear blue skies, and enormous piles of hay bales. This photo was taken when we visited Chillou du Feuillet in September. 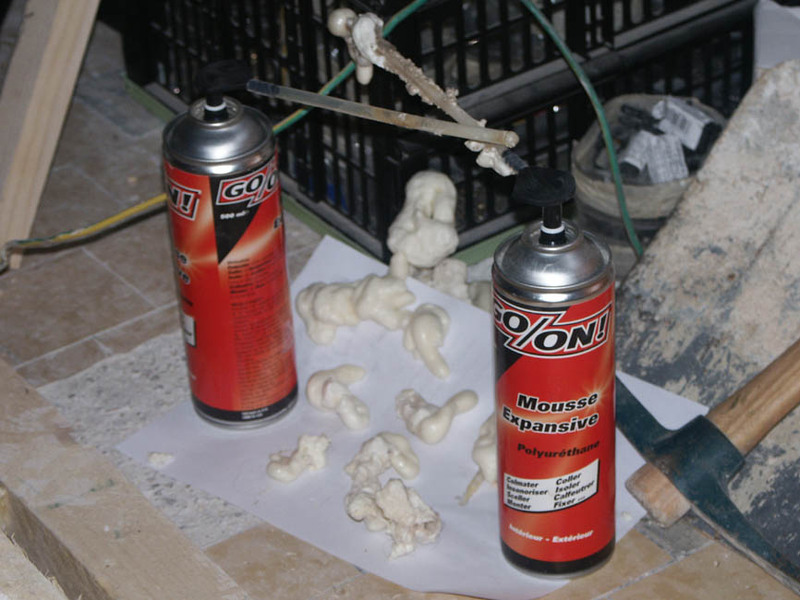 Technically, it's "mousse expansive", or in English "expanding foam" but around these parts it's just goo. 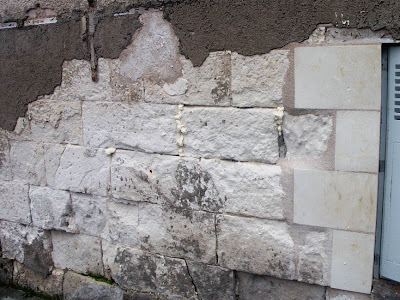 Squirt enough of it into a hole and it will expand to fill all the spaces: a brilliant idea when you're dealing with a stone wall where much of the mortar has disappeared, or the gap between a stone wall and a brick wall where no serious attempt has been made to join the two. Our kitchen wall has these sorts of issues, so for the past week I have been squirting goo like it's going out of style. It takes a week, because after you fill one gap you have to wait for the goo to harden before you can fill the gap next to it. 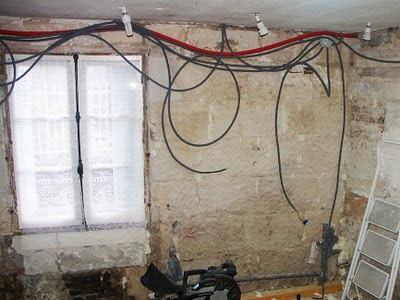 I think we are getting close to having the problem sorted, because now I dont feel a breeze anywhere when I pass the back of my hand in front of the wall. its way outside. Then you know the job's done. So far I have used three cans on the job, but once it is done we can insulate the wall with laine verre (glass wool) safe in the knowledge that not only does the goo stop the wind, it stops water as well. 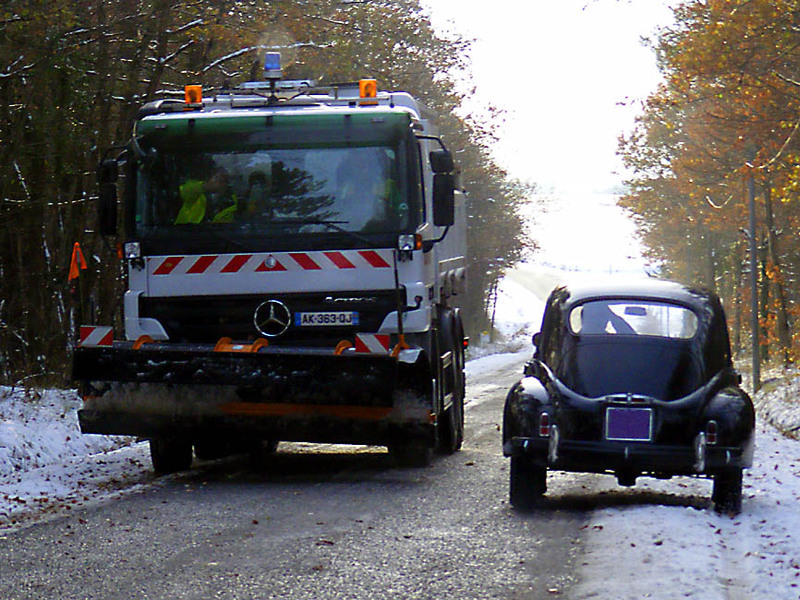 Salt for the roads in Touraine has quite a journey. It comes from Spain by sea, then is trucked into the Touraine. The authorities are assuring us that there will be no shortage, even if this winter is Siberian. Every year a contract for this indispensible commodity is signed with a supplier and the roads are salted to ensure safe travel in the snow and ice. The responsibility for overseeing the contract is shortly to change. At the moment it comes under the auspices of the Parc routier départemental de l'équipement (PRDE), but from January 1, due to decentralisation, the conseil général will take over. Our local salter snow plough truck on its rounds. According to the PRDE spokesperson, this isn't a big change, in view of the fact that there will be no change of supplier over the next 4 years. The contract is unusual, in that it doesn't specify a precise quantity of salt, or even a minimum and maximum figure, but an estimate based on previous years' consumption. The French financial year runs from 1 January to 31 December, which means that the annual contract always bridges two financial years. To make it even more of a pain to administer, the final bill is never known in advance, making it very difficult to budget for. In a mild year, the Touraine might spend 150 000 euros on salt, but in a severe winter it could go as high as 600 000 euros. Last winter the total spend was 400 000 euros. The supplier is required to supply the necessary quantities in a timely manner, even when the official weather forecast doesn't predict the bad weather. The salt is extracted from a mine in Spain. It takes 12 hours to get it by truck to the Touraine, but this is a very expensive way of transporting it, so it is put on a boat as far as Rouen or Rochefort, where it is stockpiled. As the need arises it is trucked to 19 depots in Indre-et-Loire and from there the big salter vehicles are loaded. If there is an emergency, or any risk of a break in the supply line, the supplier is obliged to truck the salt directly from Spain. Transport accounts for roughly half the annual bill. 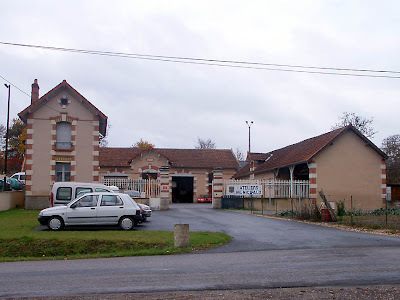 The Council depot in Preuilly. Two years ago, 5600 tonnes of salt was spread on Tourangelle roads, last winter it was 5200 tonnes. How much will it be this year? This much is certain - salt will continue to be an indispensible product for a long time to come if we want to keep our roads usable in snowy weather. 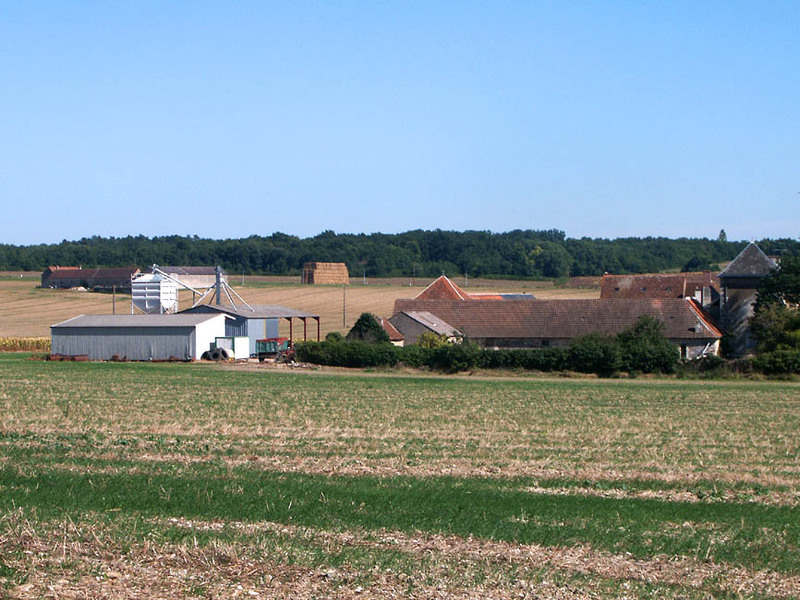 There have been promising experiments with using sugar instead in Switzerland, but the Touraine has no intention of following their lead. Source: La Nouvelle République 10 dec 2010. 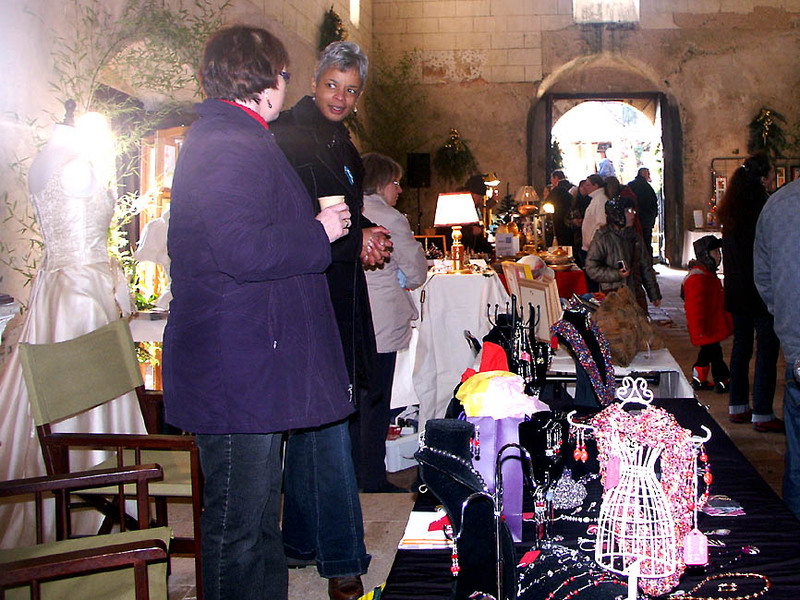 Yesterday we went to Ferrière-Larçon for the Christmas market. Jean from "A Very Grand Pressigny" was there selling handmade jewellery, so we went along to give moral support. It was her first time selling at a French market and she confessed to trepidation about the language thing - unnecessarily, as she appeared to be doing fine when we saw her. There was a good selection of artisanal food - cheeses, honey, saucisson and the like - as well as well crafted hand knitting, soft toys, napiery and bags, old linen and embroidery, wood turning and ceramics and various more dubiously handmade and kitchy gift things. We thought the best was Laurent Lissy's Créations Verres (glass creations). He's going to be at le Grand Pressigny on the 23rd, so look out for him there. Susan liked what was on offer on one of the mohair knitting stalls too (Gaec du Soleil, based at La Chapelle Blanche). Most stall holders were clearly small individual makers selling a limited quantity of items ranging from the affordable to the somewhat more luxury. 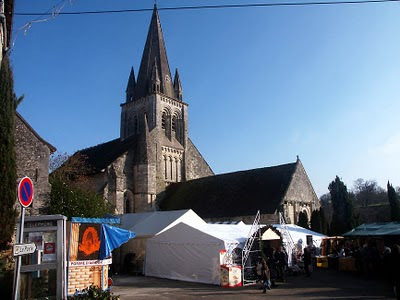 The market was in a series of tents around the church, as well as in the entry of the church. The market had about 50 stalls and was well attended - to the point of being a bit of a crush in the main tent. Although it must have been cold manning a stall, especially if you were actually in the church, like Jean, the weather was warmer than the day before, which would have encouraged the crowds. 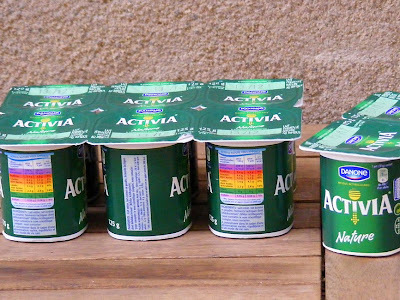 Yoghurt, or yaourt as it is known in French is very popular. 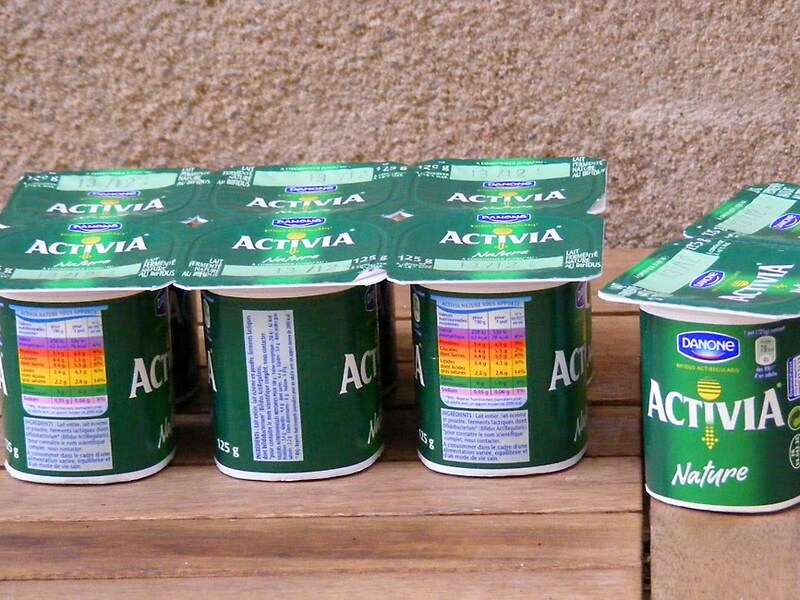 Many French women and children eat a pot of yoghurt every day, often plain, natural and whole milk. Dairy products are considered an integral part of a balanced diet, and all dairy products, including cream and butter, are considered healthy by most French people. Foods that can deliver minerals, such as the calcium in dairy products, are particularly favoured (it seems to me even over those considered high in vitamins). I suspect this is all part of the attachment to the land and terroir. Fat is not considered unhealthy per se, so there is not so much emphasis on the fat content of dairy products. It is considered to be intrinsic to flavour, mouthfeel and the general enjoyment of food, and it is assumed that you will consume it in moderation, delighting in its richness, but not being greedy. One of the few health warnings you will get is to avoid foods that combine fats and sugars – these are for special occasions only, not for every day. In the light of this I was interested to read recently that Danone has decided not to sell its Densia range in France. Densia is a low fat yoghurt with added calcium, designed to appeal to those worried about osteoporosis, but apparently French women are not interested in this fortified product, as they feel they already consume adequate quantities of calcium in a wide range of dairy produce. Danone, a French based company and now the multi-national rival to the Swiss Nestlé, was an offshoot of a glass jar manufacturing company which made a spectacular move from 'container to content' in 1970. From the beginning they have focused strongly on health, baby foods and medical nutrition and are the European leaders in the latter, the world leader in fresh dairy products. All the snow has melted, and the rain has gone away for a couple of days. Yesterday was sunny, but cold: 3°C was the maximum, but the morning was considerably colder. 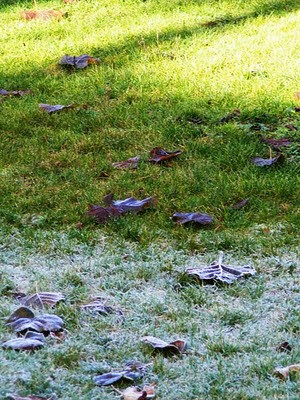 Even though the sun came out and felt warm on the skin, where the shadows remained all day the frost never melted, which made interesting patterns on the grass. This year looks like being another cold winter: two years ago the temperature reached -17°C and last year we had -15°C. Everybody around was saying that this winter can't be as cold, because we never have three bad winters in a row. Imparted local wisdom can be so important for people newly arrived in an area, but in this case maybe it is just natural human wishful thinking. 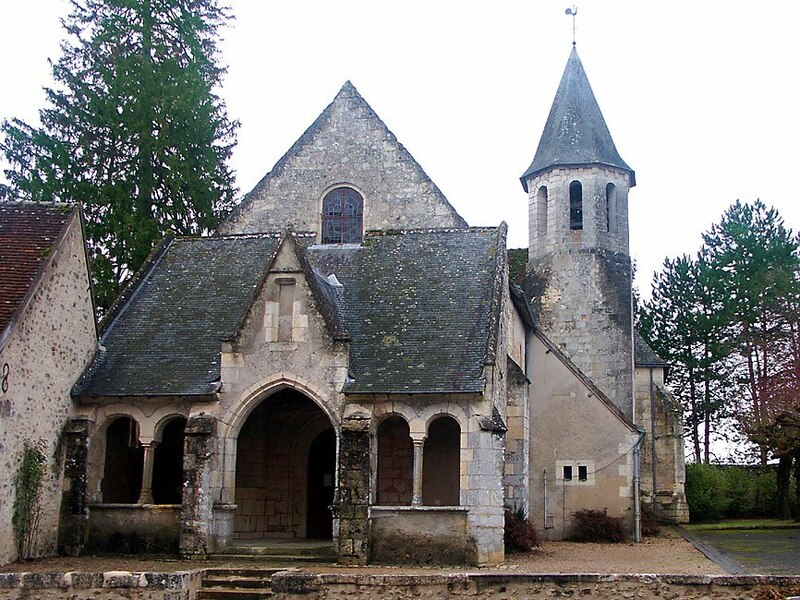 It appears that something is afoot at the chapel Saint-Melaine. I don't know if this is a temporary roof, but I suddenly noticed it about two weeks ago. It appeared just in time to keep the snow off. 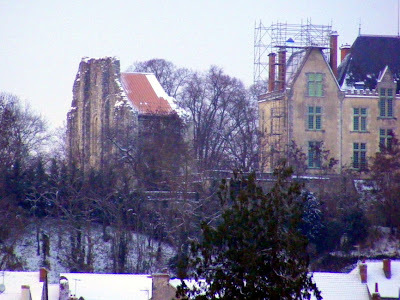 You can also see that the roof of the chateau is being repaired after Xynthia did her thing in February. In 2011 the Communauté de Communes (association of local councils) is going to start an extensive programme of works on the Claise and its tributaries. This is in order to fulfill their obligations under the EU directive to ensure all surface water is in a good state by 2015. Within this framework, around 15 public meetings have been organised to inform all the resident owners and users of the river of their rights and obligations, as well as tell them about the type of work envisaged. Between 2005 and 2008, the Communauté undertook a study of all the water courses in the Claise river basin. Several problems were revealed: water flow is too uniform; bankside vegetation is poorly maintained; over-representation of certain species (eg. 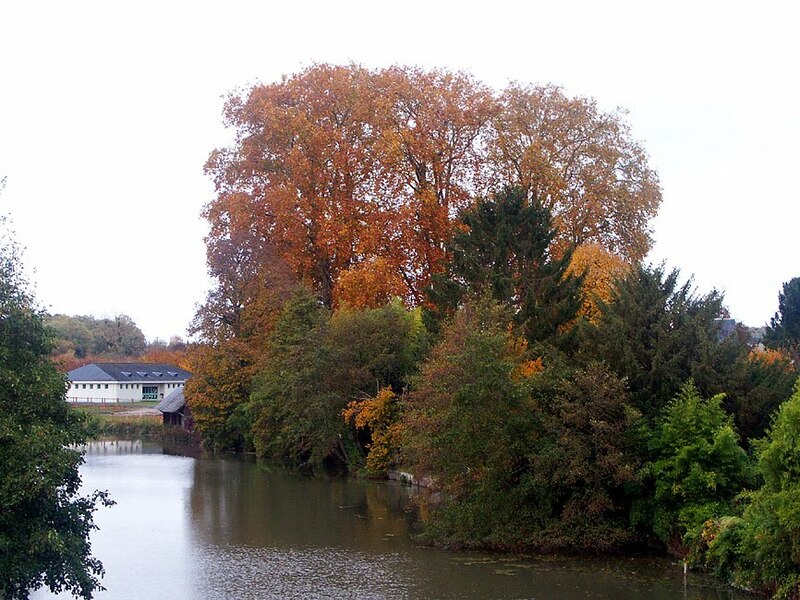 poplars); presence of invasive species (eg the non-native aquatic plant Ludwigia, known as jussie in France); build up of silt and fine gravel. If nothing is done, these imbalances will only get worse. 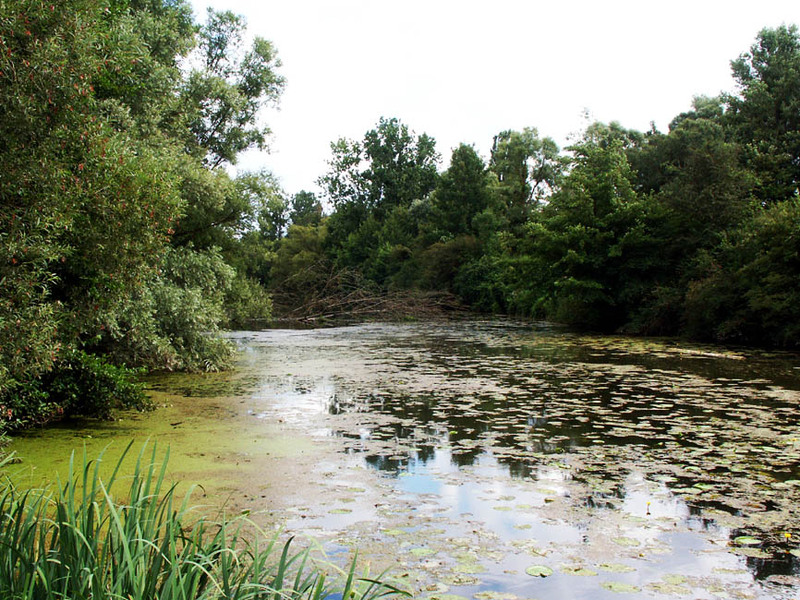 The plan is to return a more suitable vegetation to the banks and ensure the nuisance species are suppressed. Mechanisms will be installed in the river bed to enliven the flow, thereby gaining fresher, better oxygenated water and reducing sediments. 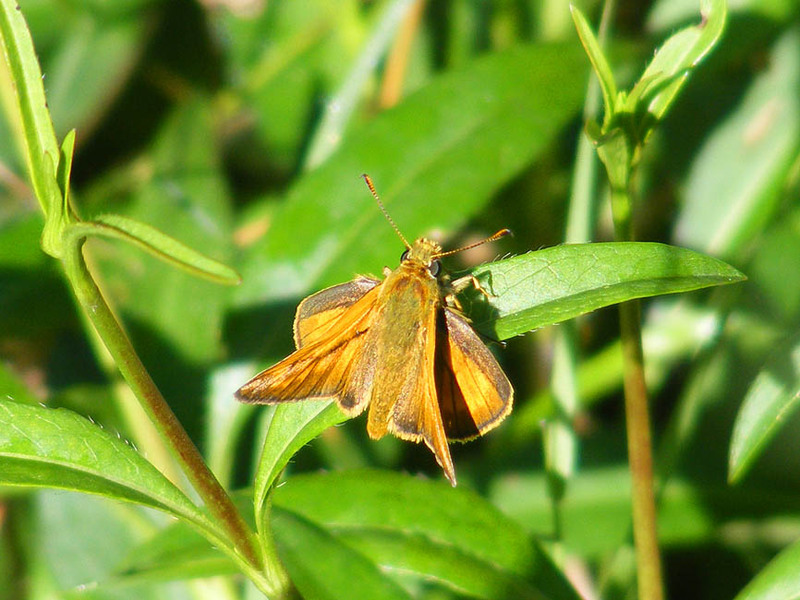 All these techniques will contribute to diversify and improve the habitat for species that populate the water courses, such as fish and invertebrates. 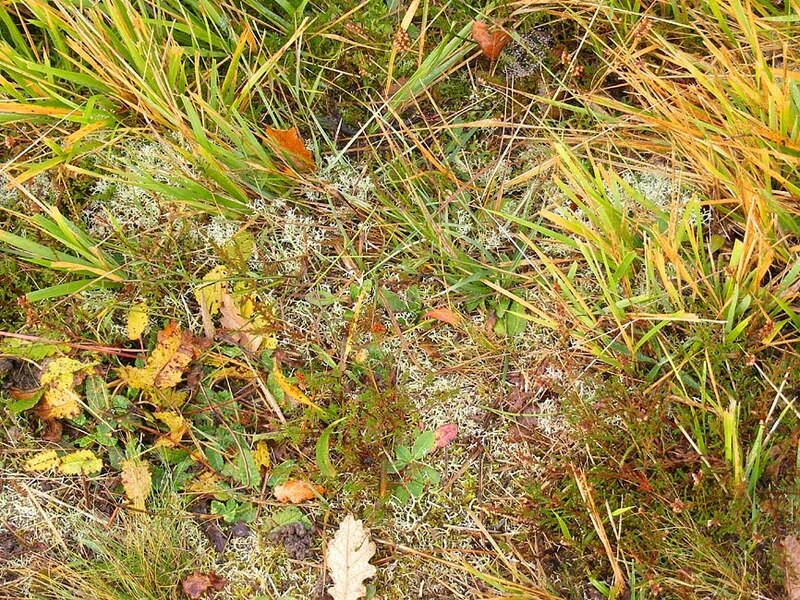 In addition, the Communauté intends to co-ordinate with the licenced trappers in their fight against the coypu, a particularly unwelcome 'guest'. It is estimated that the programme will cost 1.68 million euros over a period of 5 years. 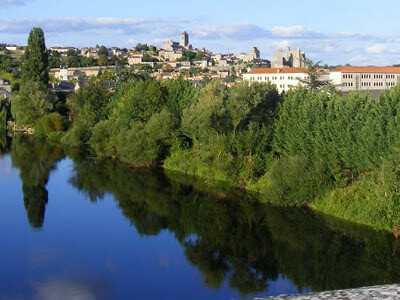 Funding of 1.347 million will come from the Loire-Brittany Water Agency, the Region (Centre) and the General Council of Indre-et-Loire. 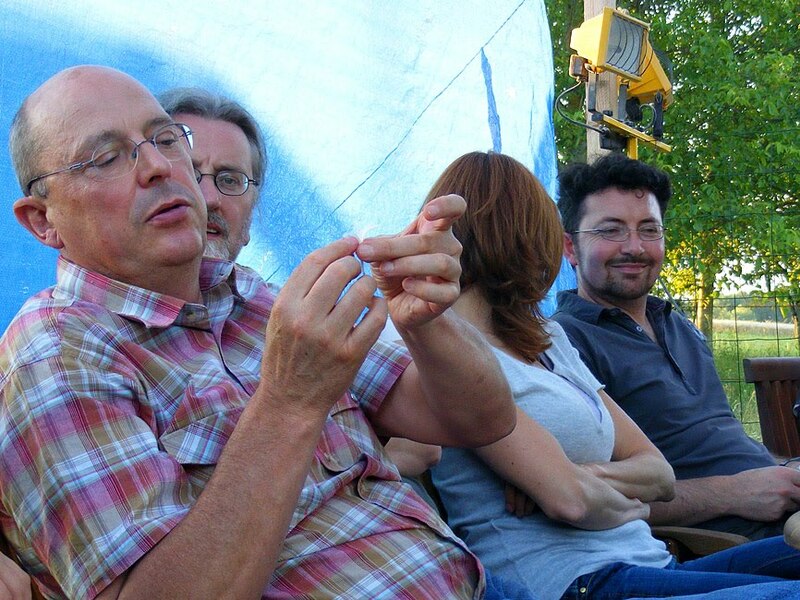 The Communauté itself will also contribute. In principle, each landowner must maintain their own bit of the river. 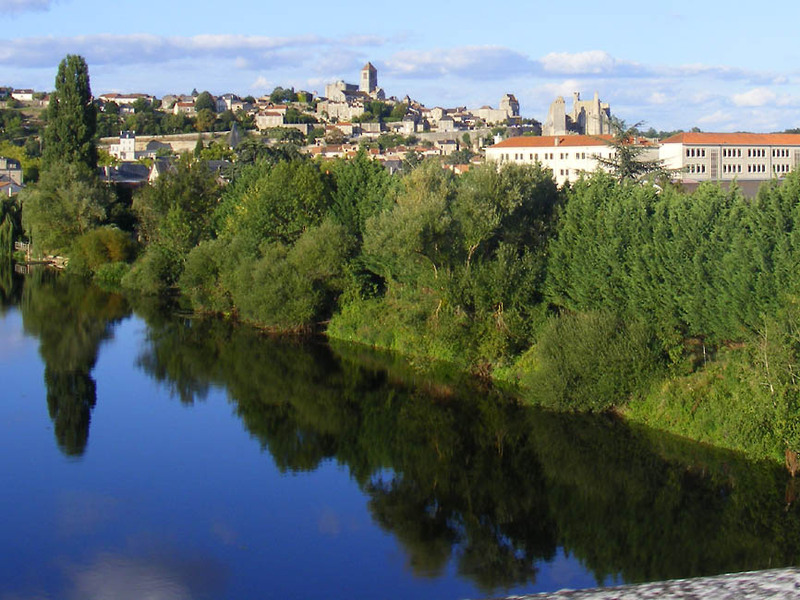 With this programme the Communauté de Communes de la Touraine du Sud will act on their behalf in order to be able to respond more quickly to the EU directive. Nevertheless, this programme of works should be seen by everyone as the time to relearn best practice, and at the end of it we can enjoy the improvement of the water resource in our district. 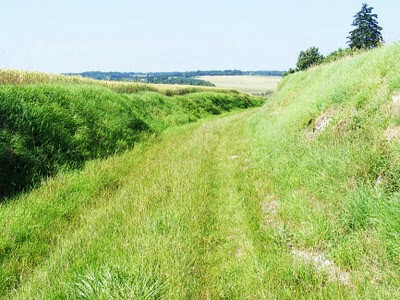 Source: Zoom sur de belles rivières dans le sud; Panorama de la Touraine du Sud; 2e semestre/No11. 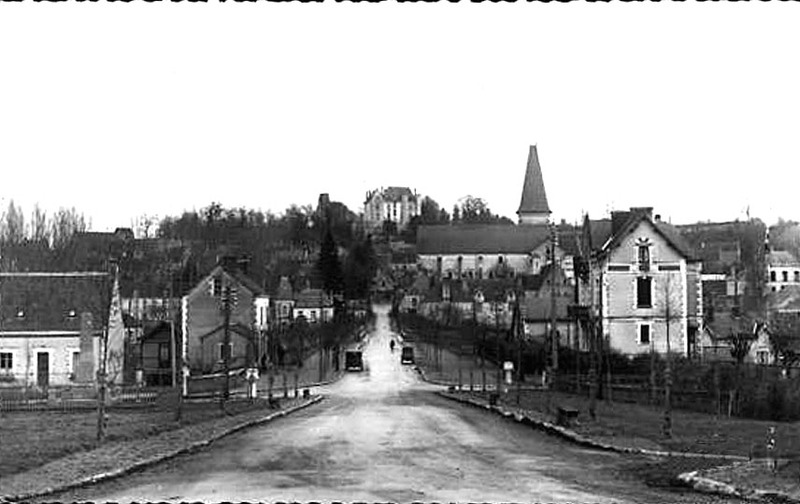 I recently found a photo of Preuilly sur Claise in 1951, taken from near the station and looking towards the chateau. The station is closed, the trees have grown, but as the song has it, everything that's small has to grow. 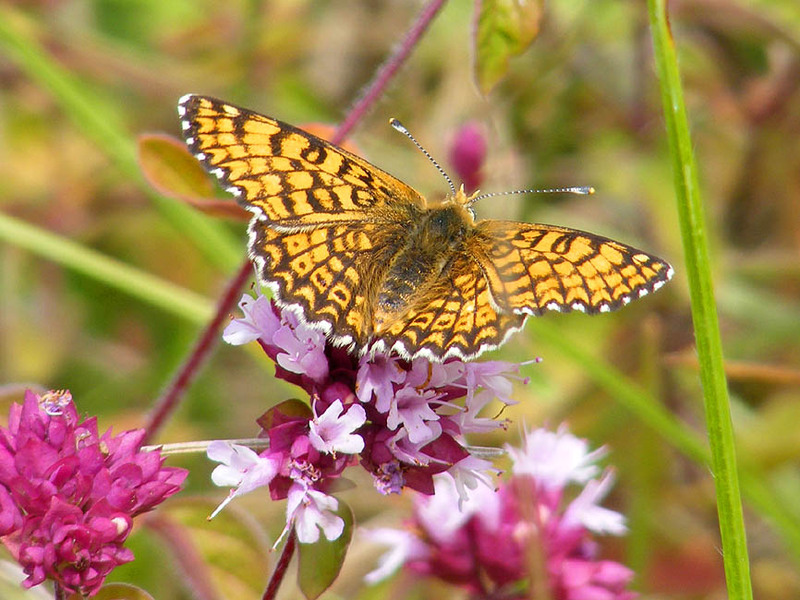 This year I submitted some photos of butterflies for the Butterfly Conservation European Interest Group calendar, which is sold to raise money for butterfly conservation in Europe. I didn't have much hope of having any of mine selected because I'm just not a good enough photographer, or using a good enough camera, and all my half decent shots are of quite common species - no thrilling rarities from Hungarian meadows here... Nonetheless, since I've prepped the photos, I thought you would like to see some of them to cheer up a winter's day. They were all photographed around Preuilly. 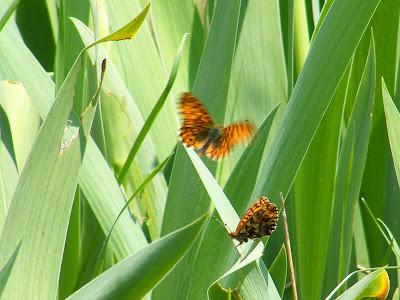 Violet Fritillaries Clossiana dia fighting amongst Bearded Iris on a sunny bank, April 2010. Large Skipper Ochlodes sylvanus, July 2010. 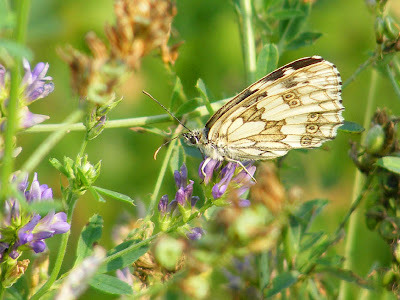 Marbled White on Lucerne Medicago sativa, June 2010. Glanville Fritillary Melitaea cinxia on Wild Oregano Origanum vulgare, August 2010. 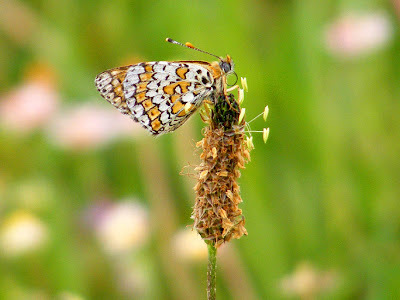 Glanville Fritillary Melitaea cinxia on Plantain Plantago sp, the larval food plant, May 2010.